It’s been three years since Metronomy released The English Riviera to widespread critical acclaim, and for good reason. The bands third album was a shimmering masterpiece, and where it was sparkling its follow-up is darker, more subdued – which kind of works. Joe Mount said that Love Letters was written about being on tour, away from home and loved ones, so it’s understandable that it’s a departure from past works. Even its title implies a distance, and that distance seems to increase as the records ten tracks progress. It makes for a more humbling listen, which is less blissful and more brooding, whilst keeping that quirky Metronomy charm that they developed on their last record. Take the title track and its crooning soulful vocals, making for one of the faster and more upbeat entries, and it’s a fitting lead single. It’s a cheery track with darker undertones, hidden by the delightfully 70’s feel that it cruises on, channelling Bowie and ABBA. 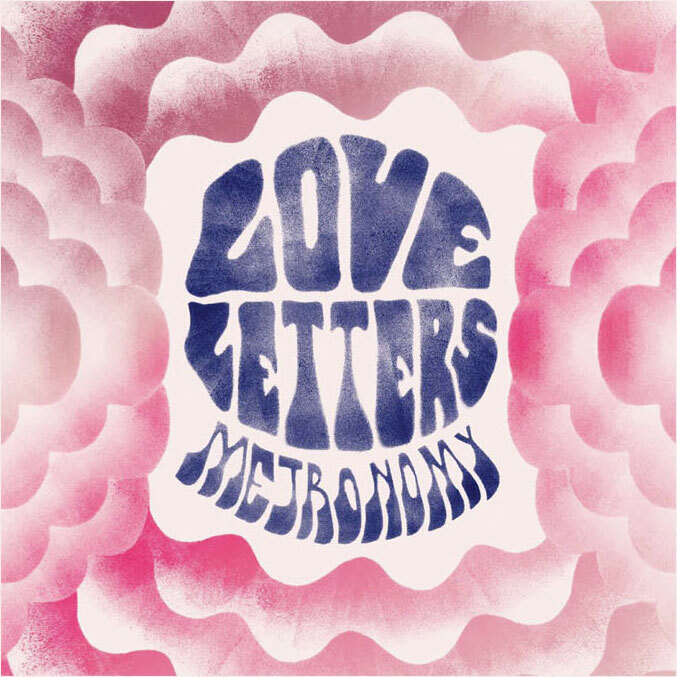 The album edit drags on a little, as do a lot of the tracks on Love Letters, but along with next single I’m Aquarius and ninth track Reservoir it marks the best that Metronomy have to really offer on their fourth full-length. The former features the line ‘You said our love was written in the stars / but I never paid attention to our charts’, and despite its honest nature it carries a really great relaxed vibe that sits well with mellow vocals and coasting instrumentals. Metronomy sort of drift, always moving in the right direction whilst perking up for a catchy chorus, and as a listener you can’t help but drift along with it all, and this is where Love Letters excels, where the band find the perfect blend of relaxed and contagious, and the second track is absolutely spot on, although few other tracks come close. Love Letters can be considered a step forward, but also a step back. If Mount hadn’t opted for darker, more pained sounds then it’s understandable that Metronomy might have struggled to recreate what made The English Riviera such a classic, but in deciding not to retrace their steps the band have dialled it down a notch, and a result Love Letters sounds a little jaded and flat at times. The quality is much less consistent, and for every brilliant track there’s an average one, and that’s what really holds it back, for me anyway. I found it much more difficult to become absorbed by the music; it didn’t really take me on a journey in the way that Metronomy have in the past, apart from on the aforementioned I’m Aquarius and the brilliant Reservoir. Opener The Upsetter is pristinely produced, as is all of the record, but it doesn’t really leave a mark, with its muted drums and delicate acoustic guitars offering very little except ambience, and the same can be said about Call Me, which seems to pass by all too easily. Third track Monstrous mixes things up a little and opts for an eerier feel, and its strange instrumentals could easily soundtrack the basement level of a retro arcade platformer. It’s a decent enough addition, but the whole thing is too odd to take seriously – not quite clumsy, but hardly a masterpiece. Drummer Anna Prior‘s soulful backing vocals are always excellent, especially on the chilled Month Of Sundays and the title track, but she rarely features otherwise, which is a shame. Tracks like the quirky The Most Immaculate Haircut In The World could use a bit more variety, whilst closer Never Wanted offers a bit more of that pessimistic charm as Mount croons ‘Does it get better?’ in a way that suggests he already knows the answer is a shake of the head. As with most tracks on Love Letters it seems set to ‘cruise control’, never really rising or dropping off, which both benefits and hinders it. The record flows on retro grooves from start to finish in a deliciously low-fi pop way, but it doesn’t really push in either direction, seeming content to just sort of be, if that makes sense. Instrumental sixth track Boy Racer pulsates with a throbbing energy but fails to really channel it to full effect, and ends up as little more than filler, which the record already has enough of. Love Letters is far from a bad album, but neither is it a brilliant one. It’s older and wiser, more educated and mature, but it isn’t as engrossing. I understand an artists need to progress musically, and with each album Metronomy have tried something new, to their credit, but in this case the progression hasn’t convinced me. There’s still plenty to enjoy, but I can’t help feeling a little disappointed by most of Love Letters, bar a few standout selections. However these are just my opinions and you might feel differently, which I hope you do.